Newly emerged video footage shows the moment Turkish police used excessive force against a group of lawyers protesting against the arrest of attorneys representing the Cumhuriyet daily, one of Turkey’s oldest and secular newspaper with a critical stance. In the 45-second video, viewed hundreds of times on Twitter, at least 10 lawyers were dragged by the hair by a group of police officers and taken into custody for publicly protesting the operations against the daily. 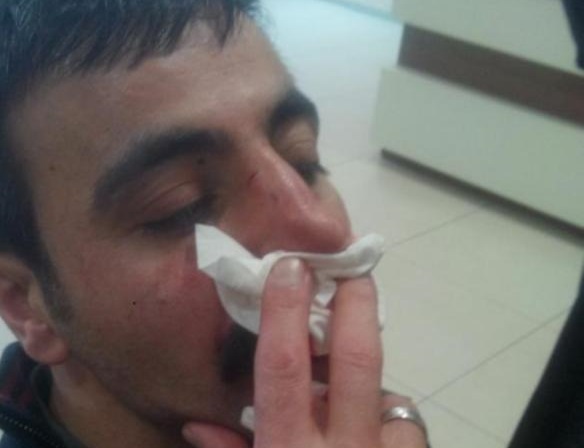 According to the Cumhuriyet daily, eight lawyers were taken into police custody while Gökmen Yeşil, president of now-closed Progressive Lawyers’ Association (ÇHD), had his nose broken during the chaos. Nine journalists and executives from the Cumhuriyet daily, including its Editor-in-Chief Murat Sabuncu, were arrested by the İstanbul 9th Penal Court of Peace on Nov. 5. Kadri Gürsel, Musa Kart, Güray Öz, Mustafa Kemal Güngör, Turhan Günay, Bülent Utku, Önder Çelik and Eser Sevinç from Cumhuriyet were arrested in addition to the paper’s editor-in-chief Sabuncu. Cumhuriyet daily’s chief executive officer, Akın Atalay, was detained at İstanbul Atatürk Airport upon his return from Germany and subsequently arrested on Nov. 12. Dündar, who is currently in Germany, is cited as the prime suspect in the indictment. Cumhuriyet journalists face allegations of aiding the terrorist Kurdistan Workers’ Party (PKK), far-left Revolutionary People’s Liberation Party/Front (DHKP/C) and FETÖ. “FETÖ” is a derogatory term and acronym for the “Fethullahist Terrorist Organization,” coined by President Recep Tayyip Erdoğan and the Justice and Development Party (AKP) government to refer to the Gülen movement, which Erdoğan and the AKP accuse of masterminding the failed coup attempt on July 15.